A federal inspection report has uncovered "serious violations" at a southern California facility run by Immigration and Customs Enforcement. Among the issues: Bedsheet "nooses" hanging in cells and substandard dental care for detainees resulting in tooth loss and unnecessary extractions. The blistering report from the Department of Homeland Security's Inspector General stems from an unannounced inspection in May 2018. The Adelanto ICE Processing Center, about 85 miles northeast of Los Angeles, houses up to 1,940 immigration detainees and is operated by the GEO Group, a private contractor. It drew scrutiny from advocates last year following multiple suicide attempts and the deaths of three detainees in a three-month period, according to the Los Angeles Times. The Inspector General report found that braided bedsheets the staff referred to as "nooses" — a potential suicide risk — were hanging from vents in 15 out of 20 cells that inspectors visited. Advocacy group Freedom for Immigrants, which has monitored conditions at the facility, said the report confirms that ICE and the GEO group "systematically violate the rights of detained individuals and subject them to health and safety hazards." Adelanto is among the vast detention network managed by ICE, housing immigration detainees in civil, rather than criminal, confinement. Among the detainees housed in Adelanto, according to the Los Angeles Times, are asylum seekers, those caught in immigration sweeps and those identified by U.S. authorities as potentially eligible for deportation after arrests here. They can remain detained for years or months as their cases are decided in immigration courts. During the inspection, a guard said the problem of detainees hanging the bedsheet nooses was a daily and widespread issue, but said removing them wasn't a high priority. Detainees said the sheets can be unfurled for privacy or used as a clothesline. But one said, "I've seen a few attempted suicides using the braided sheets by the vents and then the guards laugh at them and call them 'suicide failures' once they are back from medical." The report says a 32-year-old man died after he was found hanging from his bedsheets in the facility in March 2017. In the months following, ICE documented at least three suicide attempts at Adelanto, the report says — two of which involved bedsheets. A Los Angeles Times review of 911 call logs indicate at least four other suicide attempts there between December 2016 and July 2017. "I think doing something like that is something that has crossed the mind of all of us who are locked up here," detainee Burgos Mejia told the Los Angeles Times last year. Nationwide, according to the report, self-inflicted strangulation accounts for four of the 20 detainee deaths reported by ICE between October 2016 and July 2018, including the most recent death of a detainee at the Stewart Detention Facility in Georgia. "ICE's lack of response to address this matter at the Adelanto Center shows a disregard for detainee health and safety," the report says. ICE spokeswoman Lori Haley says ICE takes the findings seriously and has agreed to a "full and immediate review of the center to ensure compliance with detention standards and expedite necessary corrective actions." The report also found that all of the 14 detainees housed in "disciplinary segregation" at Adelanto during the inspection had been placed there before they were found guilty of breaking rules by a disciplinary panel, violating their rights to due process. 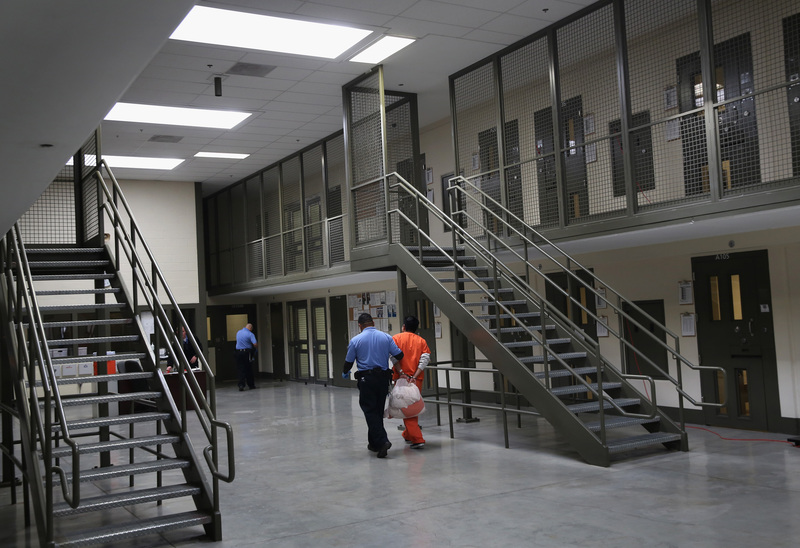 Detainees in disciplinary segregation are housed away from the general population, but ICE detention standards require a disciplinary panel first rule they committed a prohibited act at a "greatest," "high" or "high-moderate" level. The standards say disciplinary segregation may only be ordered when alternative methods can't adequately regulate the detainee's behavior. The report found one disabled detainee was improperly held in disciplinary segregation for nine days until inspectors called attention to it. The report found the detainee's bedding and toiletries were still in a bag from his arrival and that he likely never left his wheelchair during the nine days to sleep or brush his teeth. The report described long wait times for medical treatment. Four detainees said they waited weeks and months to see a doctor. The report said ICE's review of the deaths of three detainees at the facility since 2015 cited deficiencies in providing timely medical care. The facility has only two dentists to treat the nearly 2,000 detainees there, the report found, and one detainee reported having multiple teeth fall out while waiting more than two years for cavities to be filled. One dentist told inspectors he barely has time to do cleanings, so he doesn't do fillings, and offered extractions over other types of dental care. During an interview with inspectors, a dentist at the center dismissed the necessity of fillings if patients commit to brushing and flossing, according to the report. Floss is only available through detainee commissary accounts, but the dentist suggested detainees could use string from their socks to floss if they were dedicated to dental hygiene, the report said. "Although this form of civil custody should be non-punitive, some of the center conditions and detainee treatment we identified during our visit...are similar to those one may see in criminal custody," the report found. Nathalie Asher, executive associate director of ICE's Enforcement and Removal Operations, called the findings "concerning" and said ICE concurs with the recommendations. However, Asher wrote the report lacked context on certain issues. Detainees, for example, may be placed in administrative segregation while an alleged disciplinary infraction is under investigation, Asher said, housed away from the general population but with fewer restrictions than in disciplinary segregation. A new review by an inspection firm is scheduled to begin Oct. 10, according to ICE. ICE has also ordered an additional "special assessment review" to target the concerns and will develop an ongoing plan for corrective action. It's expected to be complete by January 31, 2019.